Mike Noel on the range in Kane County, Utah. Noel is referring to his head-butting with environmental groups such as the Grand Canyon Trust and the Southern Utah Wilderness Alliance. But he could just as easily be talking about his decade-long battle with the Bureau of Land Management over the Grand Staircase-Escalante National Monument. In 1996, Noel worked for the BLM doing environmental reviews. 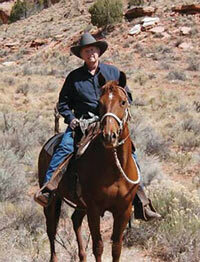 He had just finished an analysis giving the go-ahead to a proposed coal mine on southern Utah’s Kaiparowits Plateau. Later that year, President Clinton designated 1.9 million acres, including the plateau, as a national monument. Anger erupted in the local communities, which had long relied on mining and ranching; schoolchildren released black balloons, and residents of nearby Kanab wore black arm bands. Monument designation also killed the coal mine and spurred tension between Noel and higher-ups. Eventually, he took an early retirement. “Essentially, it was a totally illegal action,” he says of the federal designation. “I had the audacity to stand up and say what the administration did was wrong. I had only five more years until retirement … but it worked out OK.” Noel emerged from the ordeal as a new leader; he is now serving his third term as a Utah state representative. Indeed he has, pushing legislation from the innocuous — a bill letting taxpayers donate money to fix pets — to the contentious, including one that bolsters counties’ fights to keep roads open across federal lands. His main issue: public lands. Noel has surged forward with legislation, litigation and funding to keep public lands open to ranchers, mining and off-road-vehicles. Much of his work revolves around — or against — the Grand Staircase. Noel has played a key role in funneling state funds to Kane and Garfield counties to pay for a lawsuit over road rights in the monument. Noel, who was born in Ogden, Utah, grew up in the nomadic life of a military family, and then went on to study biology. But in 1975, he left a Ph.D. program at the University of Utah to open a restaurant in Kanab. Once tourist season ended, he took a job with the BLM. The author just completed an HCN internship.